If you've followed this blog for any amount of time, you already know how much we love our SodaStream machine. It was one of the first joint purchases Gabe and I made when we moved in together. We love it so much that both of our parents are now proud owners of their own machine. Besides the convenience of being able to make soda or sparkling water at anytime (along with freeing up cabinet space), the nutritional value of SodaStream is huge. This is what initially sold me on our first machine. I had the opportunity to check out the latest SodaStream machine - the SodaStream Source. While we love our other machine, it does not have a CO2 indicator. The indicator is golden - it lights up when your selected amount of carbonation has been completed. The machine is also much easier to manage. SodaStream partnered up with Yves Béhar, world-renowned designer and social entrepreneur to create the Source. The carbonating bottle easily locks into place with a single-push motion which is my favorite feature of this machine. 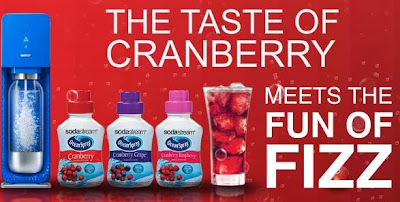 SodaStream also partnered up with Ocean Spray which was music to my ears. My favorite SodaStream flavor has always been cranberry raspberry. I like mixing this flavor with vodka to make adult beverages in it. For the last year and a half, I have wished that there was a cranberry only option. I usually make Vodka, Cranberry and Soda Water. I can tell you I loved loved loved the OceanSpray cranberry. Now if I could get SodaStream to make Ginger Beer, we'd be golden. My best friend Keri loves cosmos. 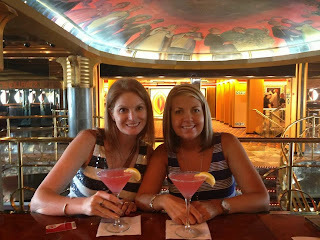 While we never make them at home, every time we are on our annual girls cruise, this is the drink of choice. I decided to make a cosmo using the SodaStream cranberry and it came out excellent! SodaStream graciously agreed to participate in the 12 Days of Christmas! They will be giving away one SodaStream Starter kit, valued at $99 with the winners choice of three full size flavors! Leave me a comment below letting me know what your favorite carbonated beverage is. I gave my sister a Soda Steam for Christmas last year and she loves it! I've been hooked on Lacroix Pamplemousse lately. Aren't they the best machines! I haven't had that Lacroix flavor yet. I may look into getting it for the office! They you would love SodaStreams version of Dr. Pepper. It is one of my top 3 flavors! We gave my fiance's parents a sodastream because they are major Diet Coke people. The taste is almost identical. I love orange or grapefruit sparkling water. Nothing better than an ice cold pepsi on a hot day! OK - I have never heard of this drink but must make it ASAP! I keep looking and looking at these. I'm not huge pop drinker, my husband is, but I'd love to have one so I could make it less calories. That's the way it is in our family too. I rarely have soda but drink a lot of sparkling water. My fiance is a soda person. Just to have the cabinet space freed up is a huge benefit (he was one of those guys who would buy 4 12 packs at a time). We haven't bought soda from the store in almost 2 years! I love Diet Cherry Cola! I'm hopelessly addicted to Dr. Pepper. SodaStreams version of Dr Pepper is AWESOME. Top 3 flavors for sure. Normally just plain ice cold water is my favorite. 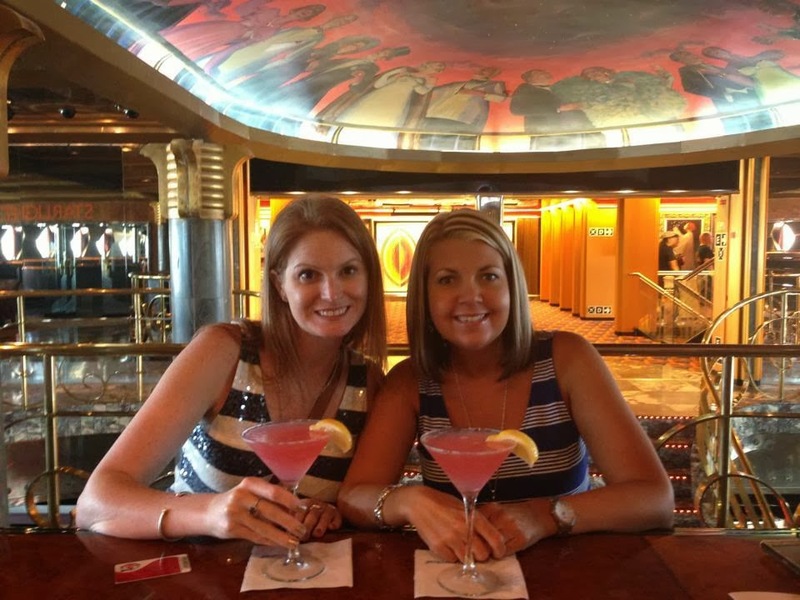 Love that cranberry cosmo idea. Even though I'm not a huge soda drinker...I really do fancy a Coke or Sprite every now and then...the soda stream machine is pretty cool indeed. That's one of the reasons I like it, if I have that rare, I want an ice cold coke moment, I can make it at anytime! Great for cocktail mixers for sure. We always bought coke for Jack and Coke and it would go flat before Gabe drank it all. My favorite soda beverage is ginger ale. Love Ginger Ale! I love Ginger Beer even more. My favorite beverage is just good ol' sweet tea. :) Also, I've been wanting a Soda Stream for FOREVER. I'm so happy you are giving one away and hope I win, lol. GOOD LUCK! I grew up on sweet tea (Grandma is from South Carolina) and cannot drink it as an adult. I like half and half tea. I'm digging this new concoction of coconut and cola flavoring mixed with sparkling water. hmmm...tell me more about this! Thank you and I feel your pain! That was how we were before the sodastream. We live on a 3rd floor condo w/ no elevator. It was one of the deciding factors when we purchased our first machine. Dr Pepper or Cherry Coke!